The 2017 Dallas-Forth Worth (DFW) Clean Cities National Drive Electric Vehicle event was the third to be held at Grapevine Mills Mall. The event has seen significant year over year increases in attendees—individuals and vehicles—and we are proud to report that the event had more than 500 attendees registered! Also of note, registered vehicles had driven more than 4.8 million electric miles—a staggering increase over the 1.8 million electric miles reported from the 2016 event. The increase of electric miles driven is attributed by the high number of Teslas in attendance. In total there were 20 distinct makes and models on display—ranging from luxury sport cars like Fisker’s Karma to more family friendly vehicles like the Chevy Bolt, Nissan Leaf, or Tesla-- highlighting that EV models suitable for any lifestyle are available TODAY! 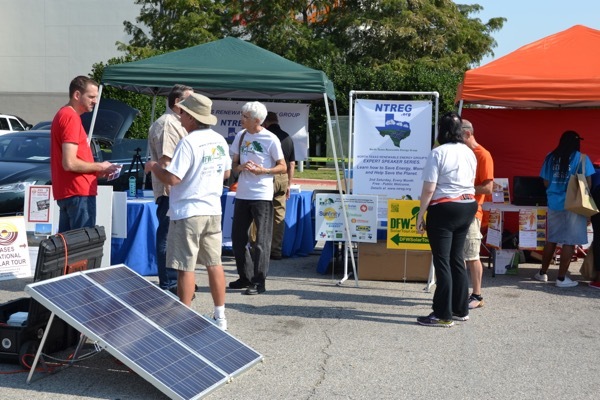 In addition to the 155 assembled EVs, the event boasted more than a dozen exhibitors, remarks from Councilman Mike Taylor, and prizes. Additional successes are that previous Grapevine Mills Mall NDEW events have resulted in EV sales and some participants drove as much as 340 miles each way to attend the event! The Saturday EV gathering was followed by a week-long webinar series. Webinar topics included EV opportunities for utilities, for municipalities, for employers, and how to sell and EV. The webinars were well attended—more than 80 participants! All webinar presentations are found on the www.dfwcleancities.org/evnt website. Last year, we broke the Texas record with 128 electric vehicles in one location. That made it the largest NDEW event outside of California and largest single gathering of Tesla vehicles. How do we best last year? With your help of course! Join us on September 9 at Grapevine Mills Mall as we look to have another record showing of electric vehicle support. Following the event, join the Tesla Owners Club of North Texas at Uncle Buck's Brewery to hang out and talk EVs. That's not all, our event will be followed by educational webinars the next week. That schedule is below! Stay tuned to www.DriveElectricDFW.org for the latest information. For now, help us spread the word about our event! Presented by Plug In America, Sierra Club and the Electric Auto Association, National Drive Electric Week - September 9-17, 2017 - is a nationwide celebration to heighten awareness of today's widespread availability of plug-in vehicles and highlight the benefits of all-electric and plug-in hybrid-electric cars, trucks, motorcycles, and more. They are fun to drive, are less expensive and more convenient to fuel than gasoline vehicles, are better for the environment, promote local jobs, and reduce our dependence on foreign oil. Are you considering going electric? Come talk to owners who have successfully done so. There are currently 515 attendees registered. Registered attendees report 4,847,964 electric miles driven.